I often get asked what would cause wall that have been added on to crack. While there are a few reasons why newly added walls would crack, especially where a new wall is joined to an old wall, the main reason is due to lack of proper foundations or the walls not being joined together properly. Every building, small or large, needs to be built on a solid foundation. It is the foundation that provides stability and support to any brick construction that sits in the ground. 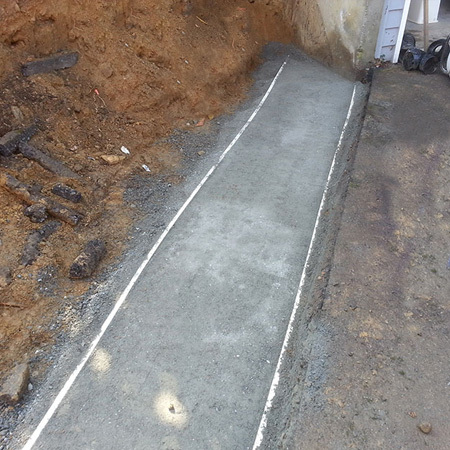 Foundations are generally built below ground level and formed using concrete. Not all foundations will be the same, due to the variation in soil conditions around the country. I have had readers ask me if it is possible to build a brick wall directly on top of the ground and the answer is no. We all know that when the ground gets wet it becomes mushy and soft. 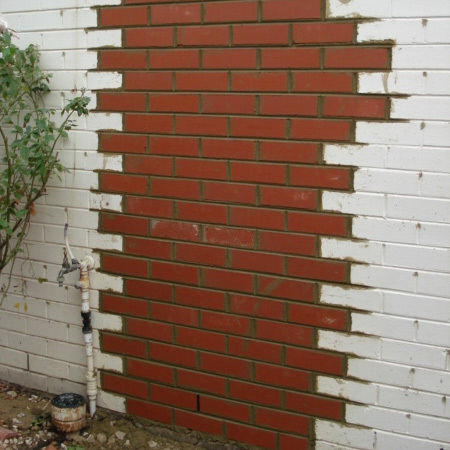 Foundations are designed to prevent any brick structure from sinking into the ground. 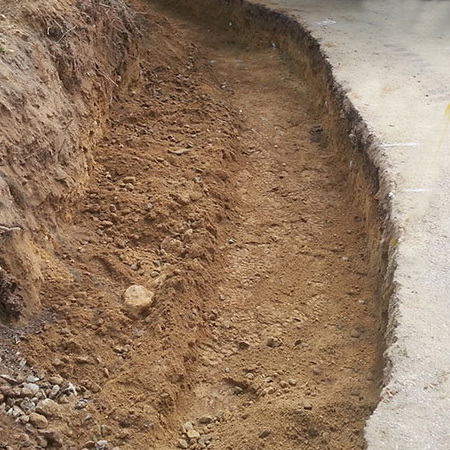 ABOVE and BELOW: Digging a trench to lay a concrete foundation for retaining wall. You can either dig out footings or trenches to fill with concrete (cement, sand and stone mix) or, build on top of an existing solid slab. Where no foundations exist the new wall will not be on solid footings and will sag or crack. When submitting plans for approval for any alterations, additions or home improvements, a Structural Engineer is required to sign off on the project. The engineer looks at what is required to comply with SANS 10400 regulations, undertakes a soil assessment if necessary, and advises on the proper materials and supplies required for a sound structure. 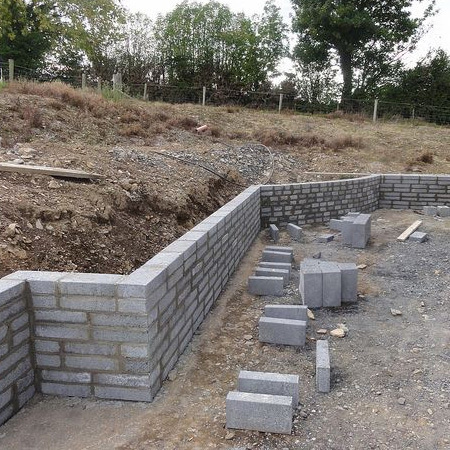 When building a new wall that is being joined to an existing wall, for example where you are adding on extension to your home, or perhaps closing off a courtyard or, as in my case, moving the wall at the front entrance to the property, it is absolutely essential that the old and new walls be ‘tied’ together. 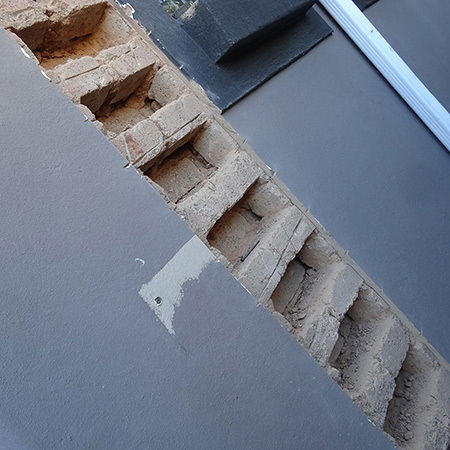 ABOVE: Chasing out bricks in the existing wall in order to 'tie-in' the new wall. While the word ‘tie’ doesn’t actually present the right picture, it involves the method of joining two walls together in such a way that they are firmly tied in place. There are more than a few ‘fly-by-night’ contractors out there who simply slap up a new wall by butting it against the old one. If you think about this type of construction: you actually have two separate walls – in no way joined together other than by a layer of plaster. Sooner or later cracks will occur between the two walls due to natural ground movement, vibrations occurring from construction around the area, or sometimes simply by weight being applied to the new structure. Tying together the walls involves removing bricks every second or third course (row), so that the new wall can be butted into and become part of the existing wall. In this way the walls are tied together to create a strong bond and have no movement. Even if you don’t plan to do the building work yourself - and this time I decided it was time to let someone else do the hard work for me - knowing how it should be done will ensure that the walls don’t crack, or perhaps even separate, later on down the line when the contractor has left and won’t return your phone calls! I am sure there are many builders out there who will question the terminology and the method of describing the process, and I would stress that this article is intended for anyone who has not previously done brick work, or has employed casual labour to build walls where there have been problems. I don’t claim to be an expert at building, but have attended brick laying and plastering courses and have built walls, extensions, and more than a few braais!